Bring water to boil in medium size sauce pan. Reduce to simmer and dissolve the agar-agar Remove from heat and allow it cool. In the small jar of a food processor make a coarse paste with grated Mahon, Parmesan, milk and cream. Continue to process into a smooth paste by adding water gradually. Add xanthan and process again to ensure that it is well incorporated. 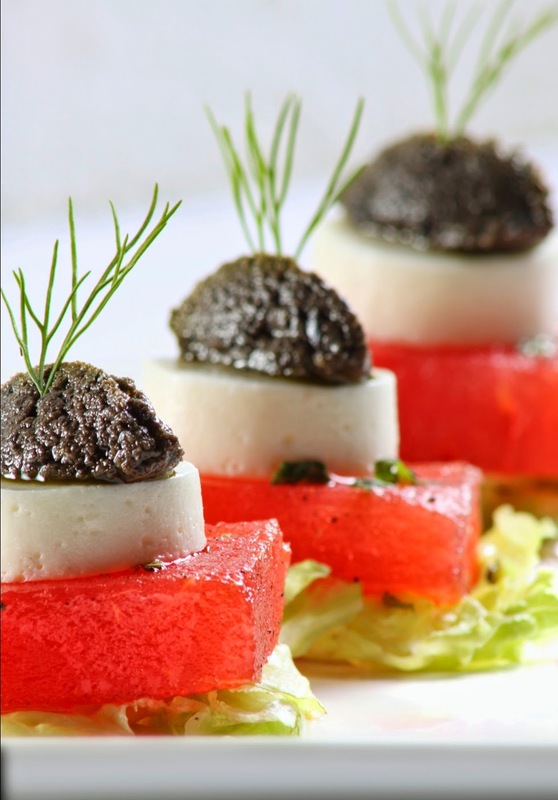 Prepare stack of iceberg lettuce, marinated watermelon and Mahon jelly. Top with quenelles of tapenade, garnish with dill sprigs and drizzle with extra virgin olive oil.